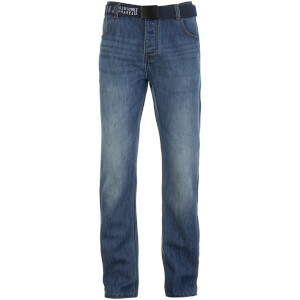 Men's 'Furio' straight fit jeans from Smith & Jones with dark wash and whiskering. Faded at the thighs for well-loved appeal, the jeans feature classic five pocket styling, a button fly and removable, branded canvas belt. Complete with leather look waistband patch and contrast topstitching. - K.N. For some years I have been buying these type of jeans from zavvi, the quality of material & manufacture is excellent & I would have to pay a much higher price for something similar in a high street shop. In addition to this, being a rather tall, slim person, I have often had difficulty in finding jeans that fit perfectly, these do, the size given is exactly the size you receive. I will be happy to buy again, with full confidence. First clothing bought and I'm more than impressed with the value for money and delivery of the product. They are exactly s advertised. Can't beat 'em for the price and a nice fit too. I loved these so ordered another two pairs in different colours.